Mike, our contributor from Japan, posted a photo of a sea-hawk as part of his Bird Photo series. Anu, our contributor from India, also wrote about a bird, the Indian roller. The Indian Roller is a bird which is quite common all over India, especially Southern India. It is the State bird of Karnataka, and we saw it quite often on our visit to Hampi, Aihole, and Badami. Celia, our new contributor from Kazakhstan, wrote about plans to build a giant dome over the government and financial districts of the capital city of Astana. It’s begun snowing quite a lot in the past week, and it’s getting colder. But according to a recent news article, local architects are interested in building a giant dome over the government and financial area of Kazakhstan’s capital. The article claims this is already being done in Houston, where a mile-wide dome would enclose “a business center, green areas, and luxury housing,” protecting us poor Americans from tropical winds and oppressive heat waves. Ana, contributing editor, wrote about exploring new aspects of her hometown of Buenos Aires. Whoever said that you never really know a city was right. I’m still discovering new aspects and parts of Buenos Aires, even though I lived there for over thirty years. Maybe that’s why there are so many places I haven’t seen: one tends to take one’s hometown for granted. Mike, our contributor from Japan, published a moving photo of an Okinawan lady worshiping her ancestors. The 95 year, young woman smiled and gave me permission. Ancestor worship is practiced in Okinawa, Japan. The woman prayed and made offerings. Anu, our contributor from India, describes a visit to Udupi. San Telmo is the oldest neighbourhood of Buenos Aires. The narrow cobblestone streets are lined with old houses, with a handful dating back to colonial times. San Telmo used to be a well-to-do area until the Yellow Fever epidemic of 1871, when the rich fled to the healthier northern side of the city, in what is now known as Barrio Norte and Recoleta. Curious to read what our contributors write on their blogs? Here’s a few examples. Mike, our contributor from Japan, muses on the nature of islands on Photo and a question: what is an island? This photo was taken today, on the northeast coast of Okinawa, Japan. There’s way too much information on the world wide web. Some folks say an these things have to be at least two acres in size, to be considered an island . Otherwise, they are just a rock. I have fallen in love with Runcible Spoon, a cafe hideaway with a quirky name taken from a whimsical line in Edward Lear’s The Owl and the Pussycat (‘they dined on mince and slices of quince which they ate with a runcible spoon’). We took a cruise around Lake Buchanan (pronounced buhk hăn uhn). Our guide, Miss Candy, a retired teacher from the area, helped us spot some local wildlife, such as egrets or ospreys. She shared very interesting information about the history of the manmade lake. We hopped off the boat to visit the ruins of Bluffton, a town that was submerged in 1937 when the Buchanan Dam was built. There wasn’t a lot to see; however, her narration was captivating. Here is a house in a small village in rural Japan. 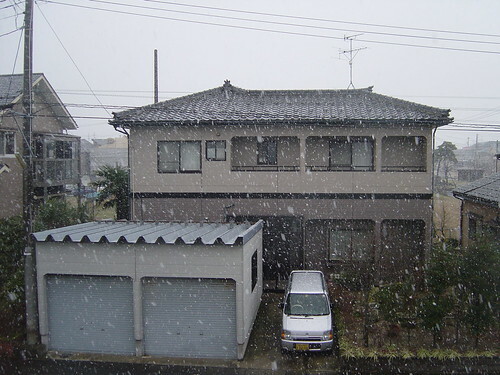 While most people in Japan live in flats there are some freestanding houses, especially outside of big cities. This is what some of our contributors have been doing in their personal blogs. Have a read! Anu, our contributor from India, wrote an account of her visit to the Galtaji temple in Jaipur, which she complemented with great photos. Here are some interesting posts written by our contributors on their personal blogs. Ski, our contributor from Hong Kong, wrote a post about the coffin houses of Hong Kong. Cage homes. Coffin Houses. Whatever you call it, the poor lives in the dirtiest secrets of Hong Kong. Mike, our contributor from Japan, posted photos taken at the Kurashiki Dam. Ana, a contributing editor, wrote a post about history museums in Dallas. The area where John Neely Bryan is thought to have built his first log cabin in 1841 is now known as the West End Historic District and that’s where history buffs should begin their tour. A replica of his one-room cedar cabin is located at the Founders’ Plaza, bordered by Elm, South Market, Main and South Houston streets.